How does Pod Volunteer set its volunteer fee levels? Pod Volunteer is run as a non-profit organisation. Pod Volunteer’s only source of income is volunteer fees so without charging a fee we would not be able to exist. Volunteer fee levels are set to match costs (see below for breakdown) and any surplus monies are distributed to the overseas organisations and charities we work with via the Pod Charity. We charge a fee to volunteers for all our placements in order to cover the overseas costs of volunteering and the costs of running our organisation in the UK. We keep the fees as low as we can but we have to ensure that we can provide the high level of support that we pride ourselves on. Non-profit (or not for profit) is generally defined as an organisation thats purpose is not making a profit and that does not distribute any surplus as profit or dividends. This in itself is still not very clear! In a similar way to a profit making organisation, a non-profit organisation has costs and must generate income in order to pay for those costs. But as a non-profit organisation, it only aims to cover its costs rather than charging the maximum it could to make profit. Any surplus (money left over after paying all the costs) at the end of the year is retained to keep the organisation running or donated to the causes the organisation is supporting, rather than being paid out to shareholders. Why does Pod Volunteer run on a non-profit basis? We have chosen to operate on a non-profit basis as we want to keep volunteer fees as low as we can to ensure that the opportunities we offer are available to as many people as possible and to help provide the projects on the ground with an optimal number of volunteers to help achieve their work. It gives our volunteers the assurance that we are only charging what we need to cover our costs. 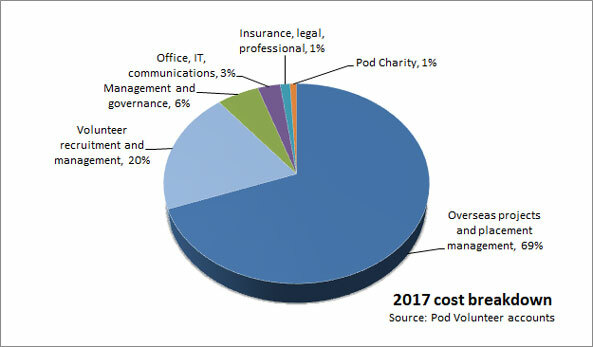 What are Pod Volunteer’s costs? Volunteer accommodation, transport, food etc. Please contact us if you have any questions on how we operate and our costs.